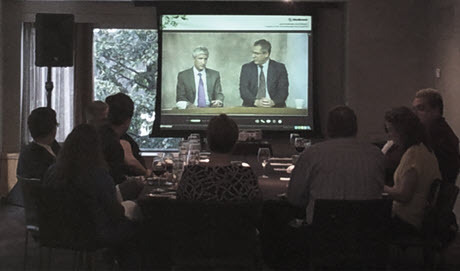 A large pharmaceutical client was hosting a nationwide dinner program, broadcasting their Key Opinion Leaders into 50 restaurants. Client had challenges previously with internet connectivity resulting in some locations not having a program and required a reliable solution. Dyventive tested all of the connectivity at the venues in advance to certify them for the program allowing the client to make a restaurant change prior to invitations being sent. On the day of the program Dyventive dispatched a technician to each location nationwide equipped with AV equipment and a redundant internet solution in case the connection at the venue had changed since the test. The client experienced no failures at any site, allowing their field representatives to confidently host the program and allow for their key messages to be delivered to the attendees.